LEADING boxing figures from across Belfast have blasted the handling of this year’s Ulster Elite Championships which have been postponed due to a clash with the Irish National Championships. 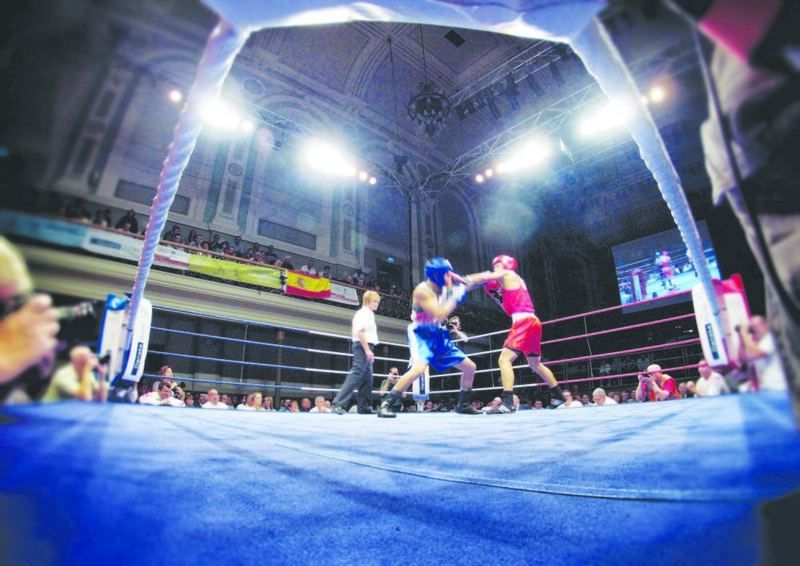 Originally due to take place in the Dockers Club next month, the Championships have struggled to attract top amateur boxers in recent times with numbers dwindling year after year. With the National U22 Championships taking place later this month, the Ulsters have been shelved until further notice, much to the frustration of local boxing figures, including Holy Trinity coach Michael Hawkins. “Any articles I have read about the Ulsters have been very negative,” said Hawkins. “You need to develop your Seniors – they are not being promoted properly. “We should be thinking outside the box. We need to get the seniors back. “The reason the Ulster Seniors were held before the Irish seniors is to give our boxers an advantage of good competition before they go to the nationals. Hawkins feels the Ulster Elites, previously the Ulster Seniors, should return to the Ulster Hall in order to rekindle the competition’s former glory and insists arguments over costs are without merit. “The money is there to promote the Senior Championship,” added Hawkins. “People can talk about the Ulster Hall being expensive but you can negotiate with the City Council. “You can build the event around the Ulster Hall. It doesn’t have to be packed with paying customers. “The Ulster Seniors is there to reward people who have helped out throughout the year and throughout the years. “There has to be a will do to it. It doesn’t have to be done by one individual or two individuals. Co Antrim Boxing President, Patrick Barnes, father of three-time Olympian Paddy, labelled the debacle ‘a disaster’ and feels the decline of the competition is the result of an accumulation of issues at the heart of local boxing. “Disaster might be the best word to use. It has been ongoing for a number of years – it has gone downhill,” said Barnes. “What can you say. . . people don’t listen! “What they need to do, in my opinion, is to make the Ulster Seniors an open competition so that boxers throughout Ireland could use it as a prelude to get ready for the Irish Seniors. “I know it can be difficult when it comes to fixtures because it happens to us in Co Antrim. “I can understand what has happened when the Irish Senior were brought forward and it congested the whole thing. “Unfortunately, a lot of people don’t want to box because certain people are involved. “It is an accumulation of things but I certainly don’t see why it cannot be resurrected. The lads need to be boxing in prestigious venues, they need to be looked after and they need to be enticed to box. “It should be in the Ulster Hall but whether it will be or can be is another matter.” He added: “You just don’t know who is going to come through the door. We (Co Antrim Boxing) had a night in the Devenish last weekend and Paddy (Barnes), Michael and Jamie (Conlan) and Sean McComb came down and we had a presentation to Dr Sean Donnelly (who is retiring). “It is the 21st century. Lads don’t need to be boxing in wee dark halls anymore. They have to be boxing in places where they look forward to boxing. Barnes also hit out at the lack of promotion being done by the provincial body. “What boxing have they done over the last three or four years? They don’t do boxing – they do refereeing and judging,” said Barnes. While Barnes criticised the Ulster Council, he still hopes the Ulster Elites can be saved. “Unfortunately, the Ulster Seniors has been the victim of the success we have had over the last 10 years,” added the Holy Family clubman. “What has happened is the All-Irelands are the number one priority. You only box in the Ulster Seniors when you had to. “By the same token, that doesn’t mean the Ulsters can’t be for everybody else. “The elite boxers are going to be taken by Ireland but what about the guy beaten in the Ulster final? He gets nothing. He should be the one the Ulster Council look after so he stays in boxing. “The way the Ulster Council has dealt with a number of issues has put people off even entering. “If you have some of the top boxers who don’t want to enter, what do you do? Ulster Council president Paul McMahon, however, insists the current state of affairs is down to the IABA moving the Irish Elites forward (from March to February) and bemoaned the lack of funding directed towards the provincial body. “It is a sad thing,” said McMahon. “The way boxing has evolved over the last number of years with IHP (Irish High Performance) and the WSB (World Series of Boxing), it is important that the best boxers qualify for the Olympics. “We have tried to follow the format of previous years when the seniors was a warm-up to the Irish Seniors and it was a prestigious event in the calendar. “In recent years, we have moved the Championships to be held before Christmas to facilitate Olympic qualifiers. “We submitted our calendar in early October to Dublin. We had the Dockers organised. We don’t go to the Ulster Hall because of the costs involved. “If you went to book the Ulster Hall for next February you wouldn’t get it. “If we had it booked for this year and had to cancel because of the Irish Elites we would lose our deposit. McMahon also offered a staunch defence of his leadership at the helm of the Ulster Council and says personal attacks on his character and commitment to the sport on social media are unfair. “Absolutely, there is too much animosity – I would agree with that,” said McMahon. “Sean McComb hasn’t entered the Ulster Elite Championships for the last two years – why not? Because of me? It isn’t about me. I am only one person. I am elected as a volunteer for a term as Ulster Council president. “If you want to play for Antrim in Croke Park and you don’t like the management, are you not going to play for the Antrim team? “There will always be disagreements but to suggest it is down to me is unfair. While McMahon hopes the Ulster Elites will take place later this year, possibly September, is it clear that the problems in local boxing run much deeper than the staging of its flagship tournament.